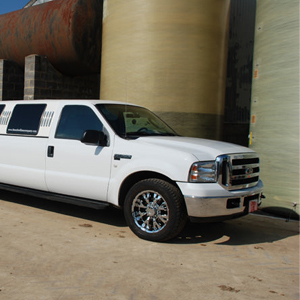 The White Ford Excursion limousine comes in either a 13 or 15 seater, ideal for larger groups travelling in and around Essex. With its unique and different style, the Excursion is one of the largest SUVs available and is perfect for any type of occasion in Essex. 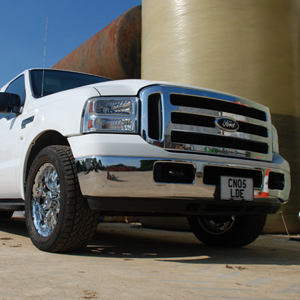 The White Ford Excursion would make an ideal choice of car for a wedding as it can transport large groups of people to and from venues meaning guests will be taken care of and will get to ride in comfort and luxury. It will be the perfect car to add to back ground of photos to make your wedding something special to remember. 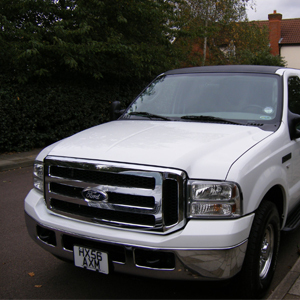 The White Ford Excursion is also a popular choice for other events such as proms, he and stag dos, and transport for executive guests arriving at any London airport. With its luxurious look and feel you're bound to make an impression at whatever event you're headed to.